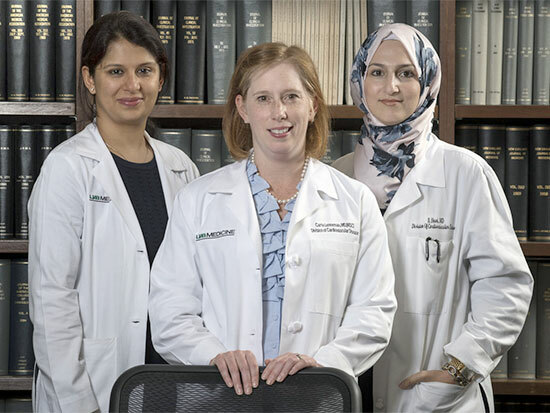 From left: Garima Arora, M.D., Carrie Lenneman, M.D., and Riem Hawi, M.D.Patients who develop cardiac side effects from traditional cancer therapies will now have a new place to receive specialized treatment at the University of Alabama at Birmingham. The new cardio-oncology program at UAB is the only one of its kind in Birmingham and northeast Alabama. Although the number of cancer survivors continues to grow, cardiovascular disease is the second leading cause of death in survivorship. The cardio-oncology program works closely with UAB oncologists, cancer survivorship programs and cancer rehabilitation specialists to return survivors to a high quality of life and improve the cardiac outcomes. “Through a detailed history and innovative techniques such as strain echocardiography, cardiac MRI, angiography, nuclear imaging and cardiac biomarkers, we identify cancer patients at high risk for cardiovascular complications and work to minimize potential cardiotoxicity,” said Carrie Lenneman, M.D., associate professor in the Division of Cardiovascular Disease. Heart disease, cancer and strokes continue to be the highest causes of death in the state of Alabama. Through the use of cardioprotective medications and close monitoring, patients can keep receiving necessary chemotherapeutic agents while minimizing their risk for developing heart disease. The cardio-oncology program also focuses on cancer survivors with modifiable risk factors or pre-existing cardiac disease. The goal is to provide comprehensive care focused on maintenance or prevention of cardiovascular disease with incorporation of healthy lifestyle factors and medical treatment. “Heart disease in cancer survivors is the second leading cause of death behind recurrent cancer, thus cardio-oncology programs are well-suited to helping cancer survivors,” said Riem Hawi, M.D., assistant professor in the Division of Cardiovascular Disease. Lenneman says pairing cardiology and oncology is unique, but the need for this program is important. When a patient is diagnosed with cancer, the patient needs timely coordination or care. The cardio-oncology clinics help facilitate timely cardiac evaluation and cardiovascular diagnostic testing. Lenneman says opening the cardio-oncology clinics has decreased wait times to nine days for cancer patients to see a cardiovascular specialist, with many patients seen the same day to facilitate coordination of multiple visits or out-of-state referrals. Lenneman says the new clinic is just the first step in helping cancer patients with cardiovascular health needs. The clinic is open in the afternoon every Tuesday, Wednesday and Thursday at The Kirklin Clinic and every other Tuesday and Friday morning at the Birmingham VA Hospital. To learn more, visit the official UAB Medicine website.